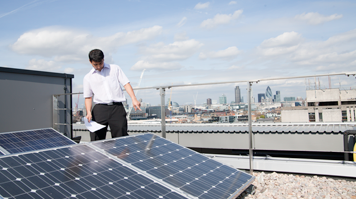 London South Bank University (LSBU) and sustainable energy firm ICAX have won £10,700 in funding to develop a novel heat sharing network in the first stage of Innovate UK's low-carbon economy competition. Run by the government's innovation agency, the Integrated Supply Chains for Energy Systems competition encourages organisations in different sectors to work together to develop low energy supply networks. LSBU's Centre for Efficient and Renewable Energy in Buildings (CEREB) partnered with ICAX to research and test out a 'cold water heat network', an innovative new heat sharing network that aims to use cold water to share heat and cool buildings on LSBU's campus. "In London, a highly significant energy use is the heating and cooling of buildings. 90% of these buildings exist and will still be here in 2050. Dealing with the energy use of the 'existing stock' is a global challenge faced by many cities, which this proposal could help significantly address," said Professor Andy Ford, Director of CEREB and Professor of Building Systems Engineering. Professor Ford and Research Fellow Aaron Gillich are currently working on the project with ICAX, who are experts in the management of heat storage and leaders in the rapidly growing cold water heat networks. The team will use the funding for further research and to create demonstration project. "A heat distribution system based upon cold water heat distribution can deliver dramatic reductions in the energy demand of existing buildings, while simultaneously providing opportunities to deliver highly efficient cooling as London warms over the coming years from the heady mixture of climate change and 'heat island' effects," explained Professor Ford. The winning proposal draws on LSBU's expert industrial reputation in building services (LSBU educates 60% of building services engineers in the UK) and refrigeration research through the Centre for Air Conditioning and Refrigeration Research. Part of the School of The Built Environment and Architecture, CEREB is a unique research and technology demonstration centre that brings together research and industrial partners to work towards the UK's challenging carbon reduction target of 80% reduction from 1990 levels by 2050. CEREB is supported by Research, Enterprise and Innovation at LSBU. The second stage of Innovate UK's competition will take place in September, which would provide funding to build the heat network on LSBU's campus.